That this program or mindfulness meditation session is designed to allow participants to explore and experience various mindfulness and meditation practices and exercises, in a guided group setting. That some introspection and silent self-reflection is involved, and during some exercises, gentle movement. That each participant will consult their doctor about any physical or mental health concerns, prior to participating. Please note that under some clinical, medical or health conditions, mindfulness meditation is not recommended. That mindfulness meditation activities – or these sessions – are not designed to take the place of personal therapy, counselling or medical intervention in any way, and are not a substitute for any kind of treatment, required or otherwise. And that while Megan Spencer is a trained mindfulness meditation teacher, she is not a counsellor, psychologist, mental health care worker or medical professional. That by taking part each participant understands and agrees that they are soley responsible for their own individual health, well-being, safety and self-care. That during each session, each participant will listen to the instructions carefully, and to their own body and mind. Participants will not do any practice they believe to be unsuitable for their current state of mind or body at any time. If there are any doubts the participant will ask for modification, support, further instruction or cease the practice. That it is the participant’s responsibility to update the meditation teacher about any conditions, injuries or illnesses, new or old, that might affect their ability to participate safely in a session, vent or program. And that they will immediately inform the meditation instructor during the session of any changes, issues or problems that arise and might affect their safe participation. Where relevant, each participant, as best they can, will undertake any recommended home practice between sessions, in order to receive the maximum benefit from the program. That late entry to sessions or events cannot be guaranteed. 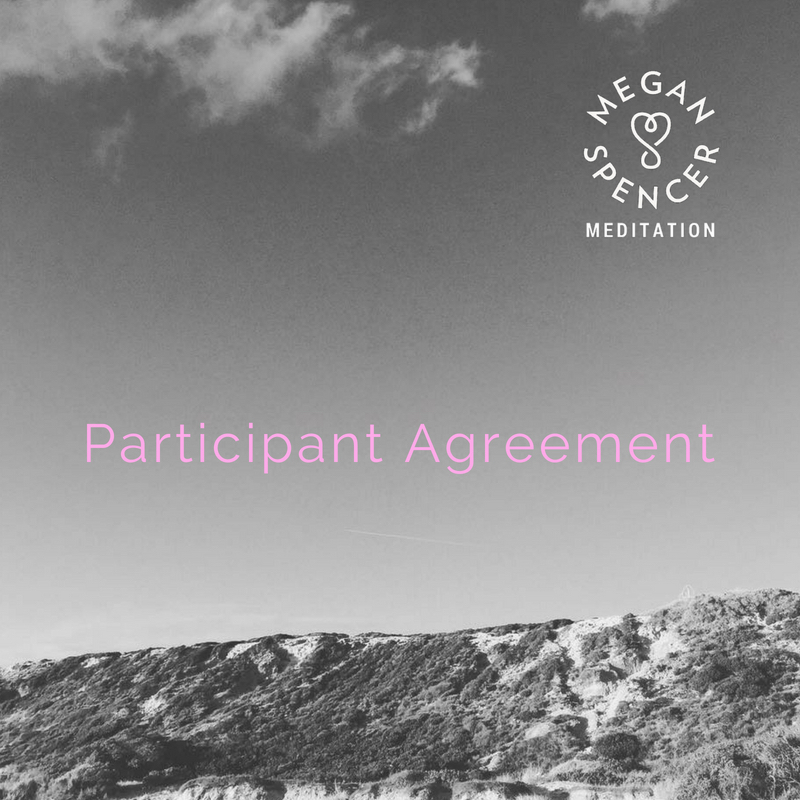 These are the Terms & Conditions for use of ‘Megan Spencer Meditation’ programs, sessions, events, consultation and affiliated events. Please read and consider carefully before taking part. Download Ts & Cs here. If you have any further questions before – or during – the program, event or session, please do not hesitate to contact Megan Spencer. Like Megan’s Facebook page to join her community and to access daily, inspiring, online resources!